Bhringraj Oil (also called Bhringraj Tail, Bhringraj Hair Oil) is an ayurvedic classical medicine. It helps treating gray hair, hair fall, headache and mental weakness. It also increases memory, promotes hair growth and prevents hair damage. In ayurveda, it is most common recommendation for almost all hair disorders. Regular massage with Bhringraj Hair Oil (Bhringraj Oil No. 1) has calming effect on the brain and induces feeling of coolness on the head. Bhringraj Oil mainly has four formulations. Bhringraj Juice is a common ingredient in all types of formulations described in different ayurvedic classical texts. The main therapeutic effect on hair problems is due to the main ingredient (i.e. Bhringraj Juice). Each formulation has different benefits and different therapeutic uses. This Bhringraj Oil formulation is most commonly available in the market. This preparation is given in Siddha Yoga Sangraha (S.Y.S.). It is best formulation for Bhringraj Oil and provides all benefits. This Bhringraj Oil formulation is described in Bhaishajya Ratnavali (B.R.) in chapter 60, KSHUDRA ROGA CHIKITSA, and Verse 130 – 135. Some companies prepare the Bhringraj Oil using this formulation. This Bhringraj Oil formulation is described in Bhaishajya Ratnavali (B.R.) in chapter 64, NETRA ROGA CHIKITSA, and Verse 271 – 272. The main purpose of this formulation is to use for nasal administration. Its Nasya improves eyesight and cures problems of hair fall and premature graying of hair. It has only three ingredients. It is also not commonly available. A large quantity of Bhringraj juice (7.5 Kg) is required for making 18 grams Bhringraj oil through this method, so pharmaceutical companies do not manufacture it. It is not cost effective. Some Panchakarma Centers and traditional Vaidya generally prepare it for their patients. This Bhringraj Oil formulation is not commonly available in the market. This formulation is described in Sharangdhar Samhita (S.S.) in Madhyam Khand, Chapter 9, GRIT TAIL KALPANA, and Verse 161-162. Actually, it is more beneficial for Scalp folliculitis and Scalp Itching. Extract juices of herbs for Bhringraj Oil and measure them by weight for the quantity provided above. Prepare herbal paste using powder of herbs described under herbs for Kalka (paste) with water or Cow’s Milk. Take purified sesame oil for making Bhringraj Oil. Mix all ingredients of Bhringraj Oil (including oil, juices & Herbal paste). Now, simmer the mixture until the Oil remains. The remained oil is now called Bhringraj Oil. Leave the Bhringraj Oil for 12 to 24 hours for natural cooling. It will be best if it is left for 3 to 7 days because it improves the quality and efficacy of the oil. Then filter Bhringraj Oil using cotton cloth and discard herbal residues. Now Bhringraj Oil is ready for use. Bhringraj Oil has following healing properties. Relieves Headache and Mental Fatigue. Prevents Premature Whitening of Hair. Bhringraj Oil is effective ayurvedic solution for hair problems and scalp infections. Well-prepared formulation of Bhringraj Oil is helpful in every disease listed in therapeutic indications above. On hair, Bhringraj Oil works on restoring natural color of the hair and strengthening hair roots and hair. In all types of hair problems, the following ayurvedic combination along with Bhringraj Oil application provides best results. This mixture helps in broken hair, thin hair, weak hair, hair fall, premature graying of hairs, graying of beard and scalp acne. According to ayurveda, Hair fall occurs to the excess VATA, which might become associated with either PITTA or KAPHA. Generally, VATA-PITTA condition is common. In such case, hair becomes weak and thin. Secondly, excess scalp dryness and undernourished hair follicles are also underlying causes of hair fall. Bhringraj Oil has effect on all three Dosha. It reduces VATA & KAPHA and rectifying PITTA. The regular use of Bhringraj Oil increases blood circulation to scalp skin and helps provide proper nourishment to the hair follicles. 5 to 10 gentle massage with Bhringraj Hair Oil is essential for achieving good results and reduce hair fall. 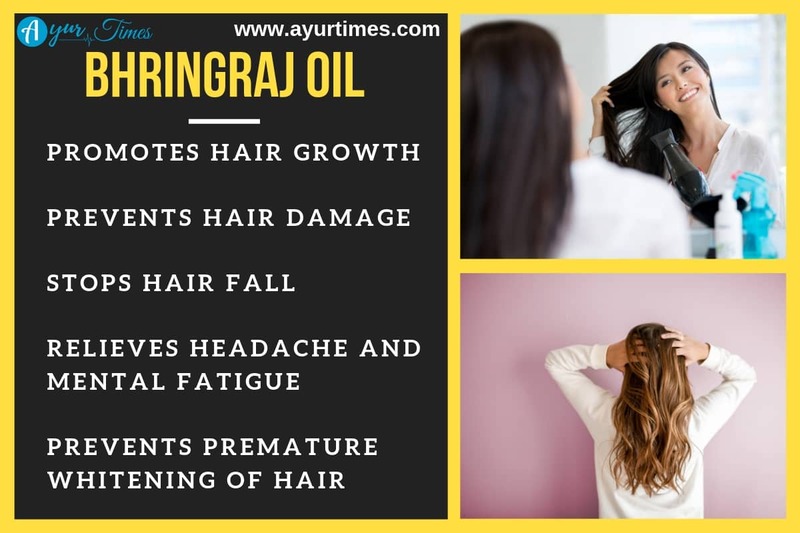 Bhringraj Oil is more effective when one has scalp itching, bad smelly scalp/hair, thin hair, broken hair and scalp infections. Dandruff has three types according to Dosha Analysis as per ayurveda. Vata Dominance: Flaking of the skin is commonly occurs due to dry skin. Flakes are generally smaller. Your skin type might be dry in such cases. Pitta Dominance & AMA association: Flakes can be yellow and mildly greasy. Scalp can be red and scalp skin can be tender (pain can be felt pressing scalp skin). Yellow scales and bad smelling scalp or hairs indicate Pitta association with AMA. Kapha Dominance: Oily and irritable scalp skin is most common cause of such type. In such case, flakes can be flaky white or white and greasy. Seborrheic dermatitis is common condition under this category. Bhringraj Oil is effective in all conditions. The daily 5 to 10 minutes massage with this oil is essential to get rid of Dandruff for a few days. Thereafter, one can use it 2-3 times a week replacing the regular oil. Bhringraj Oil can be used as regular oil safely. Lukewarm Bhringraj hair oil should be used for massage. Bhringraj Oil contains active substances of Bhringraj and Jatamansi, which are main ingredients for preventing and treating premature graying of hairs. Both herbs help restoring natural color of hair and further preventing the graying. However, a long-term application (at least 6 months) on daily basis is required to get the desired results. In addition to this, some people may also require internal/oral medications. The most commonly this condition occurs due to excess PITTA DOSHA in the body or acidic body. In such case, one should increase intake of fruits and vegetables along with following herbal powder combination. Folliculitis usually occurs due inflammation of hair follicles, which usually occurs due to bacteria Staphylococcus Aureus. Other microbes, fungi, virus may also cause scalp folliculitis. Additionally, ingredients of Bhringraj Oil have anti-inflammatory properties and reduce inflammation of hair follicles. Inflammation of hair follicles on the scalp may occur due to other causes like excess heat or wearing turbans tightly. In such cases, Bhringraj Oil ingredients help alleviating inflammation. It reduces scalp tenderness, treats white-headed pimples and scalp itching. Tinea Capitis (a fungal infection) affects hair shafts and scalp skin. It can result in itchy scalp, bald or scaly patches on the scalp. Bhringraj Oil has antifungal properties. In such case, Bhringraj Oil No. 4 formulation is more effective. Bhringraj Oil massage is more effective when patient gets relief from pain by pressing the head or forehead. This type of pain occurs due to excess VATA, according to ayurveda. The nasal administration (NASYA) with Bhringraj Oil is also effective in headache, which is generally dull type pain and patient experience heaviness in the head. Contraindication: NASYA with Bhringraj Oil is contraindicated if patient has any of following symptoms. In such cases, Cow’s Ghee (Clarified Butter) should be used for Nasya. Nasal administration of Bhringraj Oil is likely to improve eyesight. 2 drops of Bhringraj Oil should be instilled in each nostril in the morning for improving vision. We do not have clinical experience on this. Wash your hands and warm the Bhringraj Tail. Take a small amount of Bhringraj Oil and apply it on the roots of hairs. Do a gentle massage for 5 to 10 minutes. It helps increasing absorption of Bhringraj oil. Apply the Bhringraj oil on regular basis replacing your regular hair oil. Bhringraj oil is LIKELY SAFE when applied over the scalp. Its Nasya (Nasal Administration) may cause side effects.